Step up your style with a pair of our sophisticated Cream Jacquard Premium Spats. 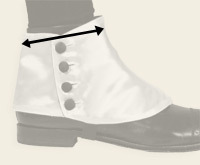 Initially created to prevent mud and muck from getting in lower-cut shoes, spats evolved over the Victorian era to be a dandy-looking addition to the gentleman’s wardrobe. This is my newest pair of Spats from the Emporium and they helped set off my evening at the Tremont in Galveston this year for the Dickens Fest. Got all kinds of complements on my dress . very well made and stylish, , will wear them again to the black tie dance and diner for Christmas . The fabric is wonderful, I also have the matching Satin puff tie. You may say people would not take a look at a man's shoes, nevertheless they do! Otherwise I would never have recieved such great compliments. The order process was easy. The holster and belt I wanted was in stock and shipped in a timely manner. I was very pleased with the quality and craftsmanship that went into making the holster and gun belt. It fits my revolver as advertised. I will definitely be ordering again from Historical Emporium. I was very Pleased With Tservice. Am wearing shorts throughout our honeymoon trip. Weight is excellent for cool Nova Scotia days and,evenings. Excellent seams and buttons are well attached.